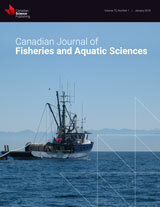 Canadian Journal of Fisheries and Aquatic Sciences 2018 75(6):836-849. Round whitefish (Prosopium cylindraceum) have a broad, disjunct range across northern North America and Eurasia, and little is known about their genetic population structure. We performed genetic analyses of round whitefish from 17 sites across its range using nine microsatellites, two mitochondrial DNA (mtDNA) loci, and 4918 to 8835 single-nucleotide polymorphism (SNP) loci. Our analyses identified deep phylogenetic division between eastern and western portions of the range, likely indicative of origins from at least two separate Pleistocene glacial refugia. Regionally, microsatellites and SNPs identified congruent patterns in subdivision, and population structure was consistent with expectations based on hydrologic connectivity. Within the Laurentian Great Lakes, Lake Huron and Lake Ontario were identified as key areas of interest. Lake Huron appears to be a contemporary source population for several other Great Lakes, and Lake Ontario contains a genetically discrete group of round whitefish. In all cases, multiple genetic markers yielded similar patterns, but SNPs offered substantially enhanced resolution. We conclude that round whitefish have population subdivision on several scales important for understanding their evolutionary history and conservation planning. Authors: Dearborn DC, Gager AB, McArthur AG, Gilmour ME, Mandzhukova E, Mauck RA. Genes of the major histocompatibility complex (MHC) exhibit heterozygote advantage in immune defence, which in turn can select for MHC-disassortative mate choice. However, many species lack this expected pattern of MHC-disassortative mating. A possible explanation lies in evolutionary processes following gene duplication: if two duplicated MHC genes become functionally diverged from each other, offspring will inherit diverse multilocus genotypes even under random mating. We used locus-specific primers for high-throughput sequencing of two expressed MHC Class II B genes in Leach’s storm-petrels, Oceanodroma leucorhoa, and found that exon 2 alleles fall into two gene-specific monophyletic clades. We tested for disassortative vs. random mating at these two functionally diverged Class II B genes, using multiple metrics and different subsets of exon 2 sequence data. With good statistical power, we consistently found random assortment of mates at MHC. Despite random mating, birds had MHC genotypes with functionally diverged alleles, averaging 13 amino acid differences in pairwise comparisons of exon 2 alleles within individuals. To test whether this high MHC diversity in individuals is driven by evolutionary divergence of the two duplicated genes, we built a phylogenetic permutation model. The model showed that genotypic diversity was strongly impacted by sequence divergence between the most common allele of each gene, with a smaller additional impact of monophyly of the two genes. Divergence of allele sequences between genes may have reduced the benefits of actively seeking MHC-dissimilar mates, in which case the evolutionary history of duplicated genes is shaping the adaptive landscape of sexual selection. Authors: Graham CF, Glenn TC, McArthur AG, Boreham DR, Kieran T, Lance S, Manzon RG, Martino JA, Pierson T, Rogers SM, Wilson JY, Somers CM. Mol Ecol Resour. 2015 Nov;15(6):1304-15. Degraded DNA from suboptimal field sampling is common in molecular ecology. However, its impact on techniques that use restriction site associated next-generation DNA sequencing (RADSeq, GBS) is unknown. We experimentally examined the effects of in situ DNA degradation on data generation for a modified double-digest RADSeq approach (3RAD). We generated libraries using genomic DNA serially extracted from the muscle tissue of 8 individual lake whitefish (Coregonus clupeaformis) following 0-, 12-, 48- and 96-h incubation at room temperature posteuthanasia. This treatment of the tissue resulted in input DNA that ranged in quality from nearly intact to highly sheared. All samples were sequenced as a multiplexed pool on an Illumina MiSeq. Libraries created from low to moderately degraded DNA (12-48 h) performed well. In contrast, the number of RADtags per individual, number of variable sites, and percentage of identical RADtags retained were all dramatically reduced when libraries were made using highly degraded DNA (96-h group). This reduction in performance was largely due to a significant and unexpected loss of raw reads as a result of poor quality scores. Our findings remained consistent after changes in restriction enzymes, modified fold coverage values (2- to 16-fold), and additional read-length trimming. We conclude that starting DNA quality is an important consideration for RADSeq; however, the approach remains robust until genomic DNA is extensively degraded. Authors: Dearborn DC, Gager AB, Gilmour ME, McArthur AG, Hinerfeld DA, Mauck RA. The major histocompatibility complex (Mhc) is subject to pathogen-mediated balancing selection and can link natural selection with mate choice. We characterized two Mhc class II B loci in Leach’s storm-petrel, Oceanodroma leucorhoa, focusing on exon 2 which encodes the portion of the protein that binds pathogen peptides. We amplified and sequenced exon 2 with locus-specific nested PCR and Illumina MiSeq using individually barcoded primers. 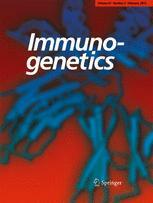 Repeat genotyping of 78 single-locus genotypes produced identical results in 77 cases (98.7 %). Sequencing of messenger RNA (mRNA) from three birds confirmed expression of both loci, consistent with the observed absence of stop codons or frameshifts in all alleles. In 48 birds, we found 9 and 12 alleles at the two loci, respectively, and all 21 alleles translated to unique amino acid sequences. Unlike many studies of duplicated Mhc genes, alleles of the two loci clustered into monophyletic groups. Consistent with this phylogenetic result, interlocus gene conversion appears to have affected only two short fragments of the exon. As predicted under a paradigm of pathogen-mediated selection, comparison of synonymous and non-synonymous substitution rates found evidence of a history of positive selection at putative peptide binding sites. Overall, the results suggest that the gene duplication event leading to these two loci is not recent and that point mutations and positive selection on the peptide binding sites may be the predominant forces acting on these genes. Characterization of these loci sets the stage for population-level work on the evolutionary ecology of Mhc in this species. Graham, C., D. Boreham, T. Glenn, S. Lance, J. Martino, R. Manzon, A.G. McArthur, S. Rogers, J.Y. Wilson, & C. Somers. 2014. Low quality DNA affects double digest restriction associated DNA sequencing (ddRADSeq). Poster presentation at Genomics: The Power & the Promise, Ottawa, Canada.